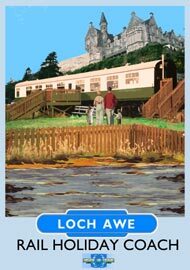 One of the great joys about the railway carriage is that it is an unusual place situated in a beautiful location with the joys of a working railway line alongside. For your own safety, please do not even think about swimming in the loch. It’s over 200 feet deep with strong currents. Please do not stray into the loch or onto the railway, and please make sure that young children are supervised if they leave the garden area. The gates at either end of the garden can be padlocked shut to create security although it would still be possible to crawl under the carriage. This is VERY strongly not advised and you will almost certainly bump something. Also, always take care on the stairs up to the carriage. There are, of course, trains. Six passenger trains a day (from 19th May 2014) in each direction Monday to Saturday and a different pattern on Sundays. This means a wider spread of trains through the day than in previous years, when there were just three. The first passes through Loch Awe around 6am. However increased insulation in the bedrooms and sitting room considerably deadens the noise as well as keeping the rooms warm. As a working railway there are occasional charter trains which provide a spectacular sight and even steam a couple of times a year. There can also be engineering trains and, very occasionally indeed, these have been known to run in the night. If there is any kind of line blockage the trains will be withdrawn. Obviously, such occurrences are beyond our control. In this instance substitute bus services will run from the top of the station road. 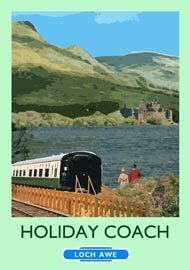 It may sound silly to say this but a railway carriage is exactly that! It’s not a cottage with stone walls so please don’t expect it to be like a house in the shape of a railway carriage. It is, of course, pretty small compared to a cottage, so there is inevitably no room for cupboards and wardrobes. There are a lot of other things to fit in, but we do of course supply plenty of clothes hangers. Insulation is bound to be less, but don’t worry; there’s plenty of heating. Please note though, there’s not much point in leaving the heat on if you go out. It will heat up just as quickly if you turn it on your return. As with all railway carriages the odd small leak can occur from time to time, it seems the windows are the most likely place. We always deal with these as soon as possible, so do please let us and the caretaker know. But don’t worry! We have an extensive maintenance programme every winter as we very much want to keep the carriage in the best possible condition. If there is anything you are unhappy about do please let us know. We want you to have a lovely holiday at the carriage.